Posted August 29, 2013 by Josette Farrell in News. 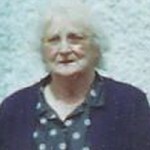 The death took place last week of Mary McDermott of Lambpark, Lackaghbeg. Formerly Mary Ryan of Peake, Claregalway, Mary worked hard on the family farm as well as in the house and rearing a large family also. Mary’s late husband Matt McDermott was a native of Dublin and inherited a substantial farm and came to live permanently in Lackaghbeg. After he married Mary who had a great knowledge of farming, it was Mary who led the way in teaching the farming skills to Matt. In the earlier years the family began to find their feet slowly but when the creamery started in Athenry and Kilconnell in the sixties, Matt and Mary came to the fore. They immediately started into milking cows and were one of the first in the area with a milking machine. Mary was the leader in the family farm with the milking of the cows and feeding the calves with the help of Matt and the family. The milk industry allowed the couple to educate their children and in later years they handed the farm to their son who went on to develop one of the largest and best milking operations in the west of Ireland. After Sean took over the running of the farm, Mary and Matt retired and enjoyed travelling to many parts of the country and visiting family members for many years. In later years they enjoyed the company of family and friends and Mary’s home was always open and welcoming to everybody. They were one of the first in the area to have a television and their home was an open house to many neighbours watching television every night. Matt and Mary suffered a major blow when they lost their daughter Una twelve years ago, while Matt passed away seven years later. Following the passing of Matt, Mary’s health deteriorated rapidly, but great care was given to Mary by her carers and family in her own home. The gentle hardworking neighbour and friend will be fondly remembered in the Lackaghbeg heartland. The remains of Mary McDermott were removed from Lackagh Mortuary Chapel to the Church of Our Lady of Knock, Lackagh. Following Requiem Mass celebrated by Fr Des Walsh, burial took place in Lackagh Cemetery. Mary is survived by her sons Pat, Sean, Brian and Rory, daughters Carmel, Gabrielle, Loretto, Imelda and Blaithin, brother John, in-laws, grandchildren, relatives, neighbours and friends.